It’s time to get your learning on. Today we’re breaking down 19 of the best free courses for bloggers in 2018. But first, can I be real with you for a minute? I’m a recovering freebie addict. Name any free course or challenge on blogging, Pinterest, email marketing, productivity, marketing or business in general and I’ve taken it. Which means my inbox has kissed a lot of slimy toads looking for my freebie prince in disguise. 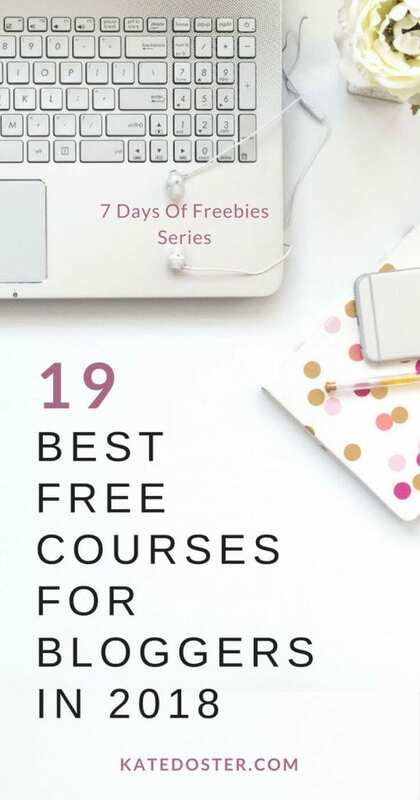 But heed my warning Don’t go freebie crazy, signing up for all 19 free courses at once – Or you’ll get ultra-overwhelmed & implement nothing which is a total waste of your valuable time. Instead of click here to pin this post your “must read” or blogging Pinterest board. Next take a good hard look at your goals for the next two weeks, – then sign-up only for the free courses that helps you reach your immediate goal faster. No more just in case learning & info hoarding, cool? This should be mandatory a free course for all bloggers. 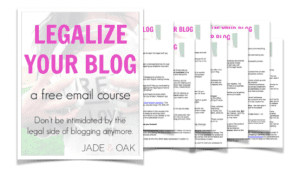 Jackie (a US attorney & blogger) packs so much crucial & useful information in this free course – I kind of feel bad not paying for. Ways to save money on taxes… and more! More of a freelancer, coach or online business owner then blogger? – Jackie has a free course just you too! Covering contracts, the difference between LLC and sole proprietorships and more. 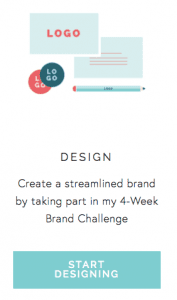 Meet my latest most epic free course – The 4 Day Launch Your Profitable Blog Challenge. Lauren covers everything from finding your blog’s style, choosing colors, fonts, and graphics to create a stunning professional looking brand in this free course for bloggers. But Lauren goes deeper than just the surface level stuff. She really gets you thinking about your blog’s core values, what you stand for and your mission. This is the perfect free course to take along with my blogging challenge course. 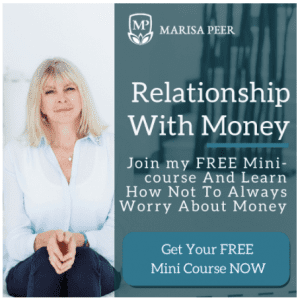 If you’ve ever had a problem with money – you’re a shop-a-lic, you don’t charge enough, your bank account is always just barely scraping you need this free RTT audio course. I know this sounds totally crazy but less than 24 hours after listening to her money regression meditation & her re-wiring for wealth training (both free with this course) I had my biggest passive income sales day ever and I wasn’t even running a promotion or launching. If you really struggle more with not feeling good enough, worthy & low esteem check out her free Self-Esteem course. I’m sure it’s just as good. Henneke is one of my writing heros. Seriously I can’t go to her site without opening a million tabs. 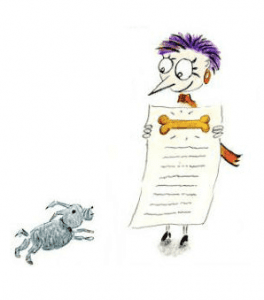 She put her best writing tips into 16 ultra-short emails with easy-to-implement tips. So you can learn how to write seductive blog posts, that win you more raving fans and sales. This free course is mandatory yall! I debated putting this free course on here because if you’re brand-new blogger, I don’t even want thinking about launching a podcast for months – But if you’ve been blogging for a while or you’re more of a talker rather than a writer you need to sign up for this free 15 – Day Course. This free course was so essential in launching my own podcast inbox besties I had to put in on here. For helping me choose what format I want, to how often to release and episodes to all the tools and tech I need, it was great. Plus he has a bonus lesson for how launch your podcast with the best chance of getting in the new and noteworthy. 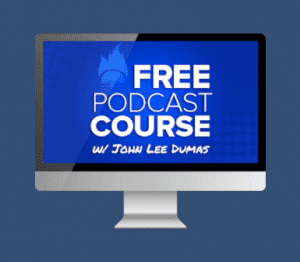 This short but powerful free audio course is my top performing freebie of all time. 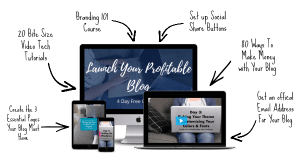 In just 10 minutes you’ll be on your way to create a freebie that readers not only love what one that actually helps build you blog’s bottom line. This is OG of free list building courses and for good reason, Nathalie gives WAY more actionable info for free then you will find in many $197 courses. From showing you how to set up google analytics to find your most popular posts, to holding your hand through finding and pitching guest blog posts it’s amazing. And Nathalie is always updating it. ✔️ Day 1: Press the big ol’ re-set button on your marketing strategy and show you how to optimize a few key areas on your page to help you play nice with the algorithms, stop killing your reach, and stop leaving money on the table. ✔️ Day 2: Learn how to turn followers into fans with my signature Waltz + Wed Technique. It’s how we put the “fun” in sales funnel, y’all. ✔️ Day 4: It’s time to jump into ads! This is your chance to amplify your content and reach even more of the right people – no techie superpowers or six-figure budgets required. I can’t wait to show you how this can work for you, regardless of your type of business! Search Engine Optimization (SEO) or Google juice as I like to call it is a great way to get free traffic and build your authority on your blogging topic. While seo is more of long-term game Fuse has an amazing way of turning all that tech mumbo-gumbo into easy to follow tips, that help boost your ranks super quick. Ever wonder how those bloggers get those icons on their sites like featured on Fox, Huffington Post & O Magazine with Janet Murray UK PR experts shows you the “backdoor” to getting mentioned in articles for the new york times, marieclaire and more even if you’re just starting out by helping out reports with their stories. Let you don’t even have to write a thing. I can’t say even about how much I love this free course! What to post on social media? How to develop your customer avatar so you know who you’re speaking to on social media – key for likes, shares and comments. I really love 50 creative social media post ideas handout she gives out. Don’t waste your time any other free Pinterest Course is this the only one you’ll ever need ever. 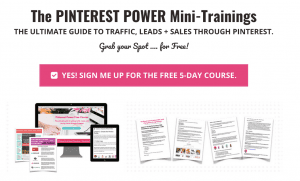 Pinterest marketing specialists and blogging wizard Summer lets you steal her exact step-by-step plan, that turned Pinterest into her most powerful traffic generating, email list building, and sales producing a system for her business. This course is an amazing mix of videos, short emails and valuable handouts. Even if you only implement half the stuff Summer tells you to do in this free course you’ll see your followers and repins shoot up. [Twitter] Honestly I couldn’t find one. This is the best free copywriting course ever! Seriously if you ever want to sell anything online like ebooks, courses and coaching you need enroll in this free course. I brought Amy’s paid course a couple of years ago, and it more than paid for itself over and over again. 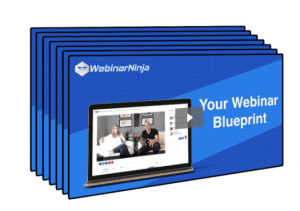 I was a little nervous about signing up for a free 7 day webinar course hosted by a company that sells webinar software but I was really surprised how much great info they gave out for free that wasn’t depended on you becoming their customers. From tips to being more confident on camera, to what to include in your webinar presentation to what to send people after the webinar. They cover alot for free. You might know Elna from her popular mommy blog but did you know she’s also a successful freelance writer? Getting paid well over $1,000 for a single blog post. 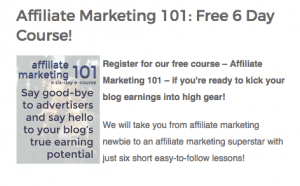 Over 6 days Lisa dishes out her best-kept affiliate marketing secrets include a huge list of affiliate program perfect for bloggers in like every single niche in this free course. Affiliate marketing is when a reader purchases an item those a special referral link you get from the company. For example, if you invest in Siteground for your hosting or Divi for your WordPress after clicking one of those links, I might receive a commission. Whether your goal for 2018 is getting in glossy magazines. mastering Pinterest or finally launching your blog these a quality free courses that can get you there. Did you one of your favorites from 2017 make the list? Or was it skipped? Let me know in the comments below; then Pin this post to your favorite Pinterest Group Board. This is a great article for some free online courses. I signed up for 2 of the courses mentioned and I already am a subscriber for Elan Cain and Jade and Oak. Awesome Nichole. I love there stuff too. What do you blog about? I blog about Gospel music and Christian young abults. Awesome post, thank you!! Signed up for a few if these courses!! Awesome Laura! I hope they help you reaching your blogging goals waaaay faster in 2018! Aweee Kate, a lady after my heart! Such great stuff in this one article. Thanks so much! Thanks Linda! Which great freebies did you scoop up? Great post!! I’m going to check out just a few (as you suggest)! Awesome Charissa! I really hope they help you out! This is SUCH a helpful post! I am bookmarking this post for reference so I can sign up for these courses! Thank you for putting this together! You’re super welcome Jennifer. Which one caught your eye the most? Thank you for rounding these up! I absolutely need to take it to the next level this year! And this is a great place to start! Excellent Rachel. I hope these help. Keep me posted! These are so helpful!! Signed up for some…. thank you so much for doing a post like this! You’re very welcome Kristen. I hope they help! Keep me updated. This is a wonderful article, so full of information. I will need to re-read it slowly to absorb everything. Thanks Barbara. I’m glad you liked all the free courses I rounded up. What free courses did you sign up for?